Łukasz Pawłowski is a political columnist and the secretary of Kultura Liberalna‘s editorial team. 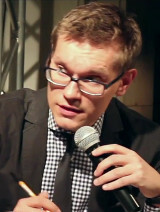 A psychologist and sociologist by education, Łukasz holds a PhD in social sciences. He completed his dissertation on contemporary theories of democracy in 2014. Before that he was a visiting academic at Indiana University (USA) and the University of Oxford (UK). Łukasz started his career as as a journalist working at Dziennik in 2008, at the time the second largest broadsheet newspaper in Poland. Nowadays, he works for Kultura Liberalna – a leading Polish liberal magazine – where he mainly writes on Polish and American politics. As the deputy-head of Kultura Liberalna‘s political department, he has interviewed many influential authors – including Aleksander Smolar, Paweł Śpiewak, Anne Applebaum and Saskia Sassen – on a broad range of political issues. In 2014, his conversation with Michael Sandel, entitled Waking from the American Dream, led to Łukasz winning the National Bank of Poland’s prize for the year’s best economic interview.